Mém. Mus. Natl. Hist. Nat. 18(7): 249 1944. Operculicarya hyphanoides in a garden in Madagascar. Origin and Habitat: Operculicarya hyphaenoides has a restricted range in south-west Madagascar, where it grows in the province of Toliara. It has an extent of occurrence of 663 km2 and an area of occupancy of 54 km2. This species occurs in five locations and the distribution is reportedly fragmented. The species can evidently be reasonably abundant locally. H. Perrier de la Bathie found this interesting species in the xerophytic bush of the "falaise calcaire sur le bord oriental du lac Manampetsa"
Altitude range: This species grows between sea level and 499 metres abpve sea level. Habitat and Ecology: This shrub or tree grows in subarid thickets on limestone notably in and around Tsimanampetsotsa. This species is threatened by habitat destruction due to the occurrence of nomadic grazing, illicit large-scale commercial timber harvesting and wildfire. Description: Operculicarya hyphaenoides is a large deciduous shrubs, with several thick gnarled trunks from common base or small tree growing up to 1.5 metres, occasionally to 3 metres tall. 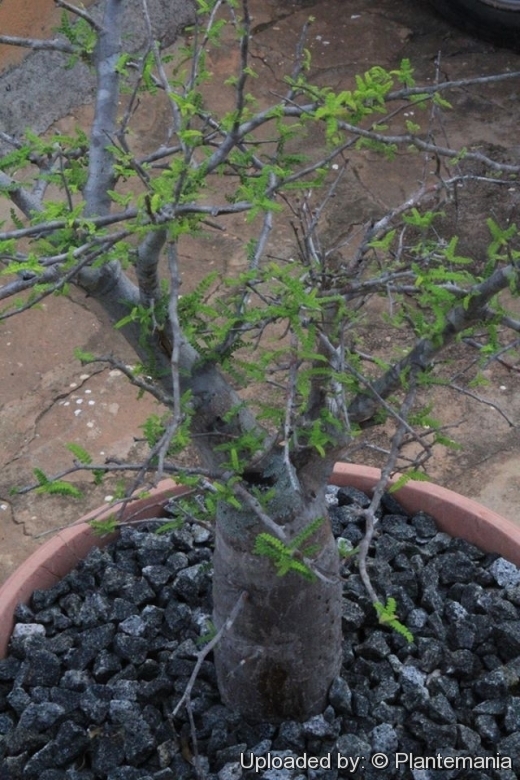 The species has a bonsai-like appearance and has appeal to specialist collectors of succulents. Derivation of specific name: hyphaenoides; from Hyphaene, genus (Arecaceae), and Greek -oides, suffix indicating resemblance: species resembling Hyphaene. Stem: Trunks several, thick, gnarled, cylindrical, up to 1.5(-3) m tall, and 0.4 m in diameter with irregularly bumpy-warty bark, each with a spreading much-branched crown. Secondary branches short (brachyblasts), to 2.5 cm long, glabrous, brownish-grey, more or less straight. *Leaves: 3-5 per branch (brachyblast), drought-deciduous, odd-pinnate with 11-20 pairs of leaflets (pinnae) 2.5-6 cm long, medium to dark olive-green, all parts densely hairy. Rachis hardly to broadly winged. Leaflets all similar, 4 mm long and 2 mm broad, roundish-rectangular with truncate tip, margins revolute, lower face with 5 - 7 pairs of raised veins. Flowers: Very small dark red, solitary or in few-flowered fascicles. Fruits: Pendent, stalked to 18 mm, depressed-globose. Related species: Operculicarya pachypus and Operculicarya decaryi are more similar in appearance to one another than to O. hyphaenoides. Notes: Operculicarya hyphaenoides is one of eight species in the genus Operculicarya, seven of which are endemic to Madagascar, with the eighth occurring in Madagascar and the Comoros. 3) Members of the IUCN SSC Madagascar Plant Specialist Group. 2015. Operculicarya hyphaenoides. The IUCN Red List of Threatened Species 2015: e.T68002803A68026485. http://dx.doi.org/10.2305/IUCN.UK.2015-4.RLTS.T68002803A68026485.en. Downloaded on 21 December 2016. 4) Randrianasolo, A. and Lowry II, P.P. 2003. “Operculicarya (Anacardiaceae) revisited: an updated taxonomic treatment for Madagascar and the Comoro Islands, with descriptions of two new species.” Adansonia 28: 359-371. 6) Rakouth, B., Ravaomanalina. H. and Rakotonavalona, A. (2006). “Etude biogéographique et bioécologique de quelques espèces menacées dans le Sud de Madagascar dans le cadre de la CITES pour l’année 2005.” Rapport final. Conservation International Madagascar. 7) “Inclusion of Operculicarya hyphaenoides in Appendix II” CITES CoP15 Prop.23 IUCN-TRAFFIC Analysis (PDF, 20 KB) <www.traffic.org/cites-cop-papers/CoP15_Prop23_Analysis.pdf> Downloaded on 21 December 2016. 9) H.Perrier Mém. Mus. Natl. Hist. Nat. 18(7): 249 1944. <www.springer.com/cda/content/.../9783540419662-c2.pdf?> Downloaded on 21 December 2016. Cultivation and Propagation: Operculicarya hyphaenoides is fairly easy to grow both indoors, as well as outdoors. In the winters it is deciduous, except in very tropical areas. Growth rate: It is a fairly slow growing plant, but in 10 years it can easily outgrow its indoor location, requiring a 'pruning'. Soil: It prefer a porous gritty or sandy soil with at least 50% inorganics, and requires excellent drainage. Fertilization: Fertilize regularly for good growth and health. Repoting: Repot the plant every 3 years; this is quite tricky given the spines. Waterings: It needs regular water when the plant has leaves since it is a tree, contrary to popular belief, it likes a lot of water in the warm summers, as long as it's planted in a very well draining soil. Indoors it is best to keep on the dry side, or it is prone to rot. During the winter they may go dormant, so water less during this period. Temperatures: Temperature from spring to autumn: nocturnal 15°C or more and diurnal 25-45°C. Wintering: nocturnal 10°C or more and diurnal 18°C or more. Cultural Practices: Operculicaryas need a dry/cool season in order to bloom. Propagation: Propagation is reportedly by seed and cuttings.. Fresh seeds results in a remarkable yield of new plants. Soak seeds in warm water for 24 hours before sowing in moist sand. Seed continue to germinate erratically for about 6 month.They are also propagated using pieces of the tuberous roots. Seed grown plants produce better looking roots which can be exposed as your plant grows. Also by choosing parent plants with certain characteristics, seedlings will carry on these traits, like the extreme "bumpy" trunks.